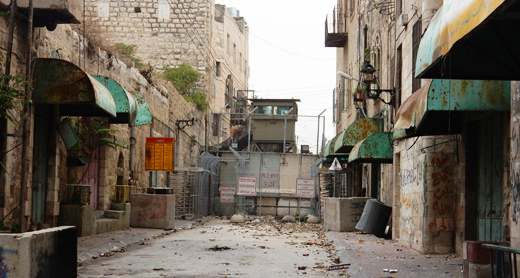 As of 29 October 2015, Israel’s security forces have closed off Hebron’s Tel Rumeidah neighborhood, denying local residents free access into and out of the neighborhood. Even prior to this date, security forces checked all persons leaving and entering the neighborhood, but since last Thursday (29 October), they have allowed access only to individuals registered as residents of the neighborhood. Even then, permission to enter or leave is given only after security checks are done and names verified against a lists held by security forces at Bab a-Zawiya Checkpoint (also known as Checkpoint no. 56). Anyone whose name is not on the list cannot cross the checkpoint and is forced to take a long, arduous detour to get home. Some neighborhood residents have not had their names put on the list to protest being required to receive a permit to enter their own homes. In other cases, checkpoint personnel have erroneously left some residents’ names off the list, so these individuals cannot cross the checkpoint either. 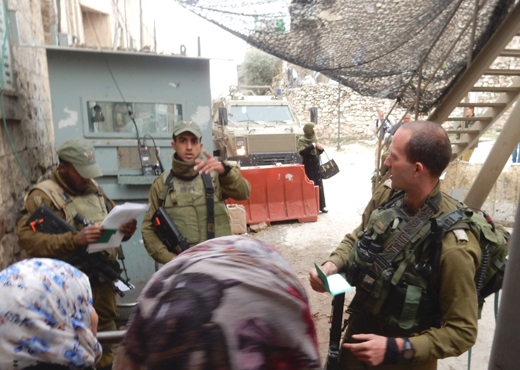 International volunteers and Israeli anti-occupation activists are also barred entry to the neighborhood, though their presence is vital for documenting harm caused to the residents. Tel Rumeidah is home to some 50 Palestinian families whose daily lives were already subject to travel restrictions and recurrent attacks by settlers. Ever since the new restrictions were imposed, residents now leave their homes only for work, school or urgent matters, and relatives cannot visit them. An initial inquiry by B’Tselem indicates that three families who had lived in the neighborhood recently left because of the harassment by the authorities. B’Tselem field researcher Musa Abu Hashhash, who has tried to visit the neighborhood several times over the past week, said: “The neighborhood is completely empty. While I was waiting at the checkpoint for the soldier to show me the military order [forbidding entry to the neighborhood to non-residents], I saw no one in the neighborhood. It looks like a ghost town”. B’Tselem’s inquiry has also revealed that all stores and businesses near the Tomb of the Patriarchs, about 20 altogether, have been closed since the new restrictions on movement were imposed. The businesses are closed as their owners are barred access to this part of the Old City. Security checks in other checkpoints in Hebron in have also become more rigorous and lengthy, leading Palestinian residents to avoid any unnecessary trips. There has been very little pedestrian traffic through the Old City and Tel Rumeidah, a marked drop in the number of worshippers at the Ibrahimi Mosque, and some of the stores in the nearby market, which is accessible to Palestinians, have remained closed as shoppers stay away from the area. Access into and out of Hebron itself has also been restricted and residents face long waits at checkpoints or using longer, rougher roads. The exit from the village of Dura, west of Hebron, is sealed by a gate. Dura residents who wish to reach Hebron have to take a narrow, rough backroad. Residents of Yatta, south of Hebron, need to cross a staffed checkpoint, where Israeli security forces check every person crossing, resulting in a massive traffic jam. Israeli security forces have also closed the gates at the exits of the villages of Beit ‘Einun and Bani Na’im, east of Hebron, forcing residents to take long detours in order to reach Hebron. Travel restrictions were imposed on residents of the village of Sa’ir as of 1 November 2015. All men under the age of 25 are prohibited from crossing the checkpoints put in place at the two entrances to the village, one between Sa’ir and the a-Nabi Yunis/Halhul Checkpoint and the other south of Sa’ir, near al-‘Udeisah. While travel restrictions Israeli security forces imposed on Palestinians in Hebron change from time to time, they are always governed by the “principle of separation”, a regime of physical and legal segregation between Israeli settlers, who receive the military’s protection, and the Palestinian majority, which pays the price of this protection. This policy has led to the financial collapse of Hebron’s downtown and a massive departure by Palestinian residents. The IDF Spokesperson told the media that recent travel restrictions are intended to prevent harm to civilians, but that the military would “continue to allow as normal a fabric of life as possible for all residents of the sector, while taking the necessary security measures given the situation”. This statement is a far cry from reality. There has been no ‘normal fabric of life’ in Hebron for quite some time, and the measures adopted in the name of security are clearly not unavoidable dictates of reality. The measures are draconian in part because they cannot achieve their stated goal, as there are detours into the neighborhood, which require great physical effort. These steps constitute collective punishment of Hebron residents. They are suspected of no wrongdoing and are forced to suffer serious disruptions in their daily lives simply because they had the misfortune of living or working in neighborhoods the military has decided to close. This policy is collective punishment and as such, it is immoral and unlawful.